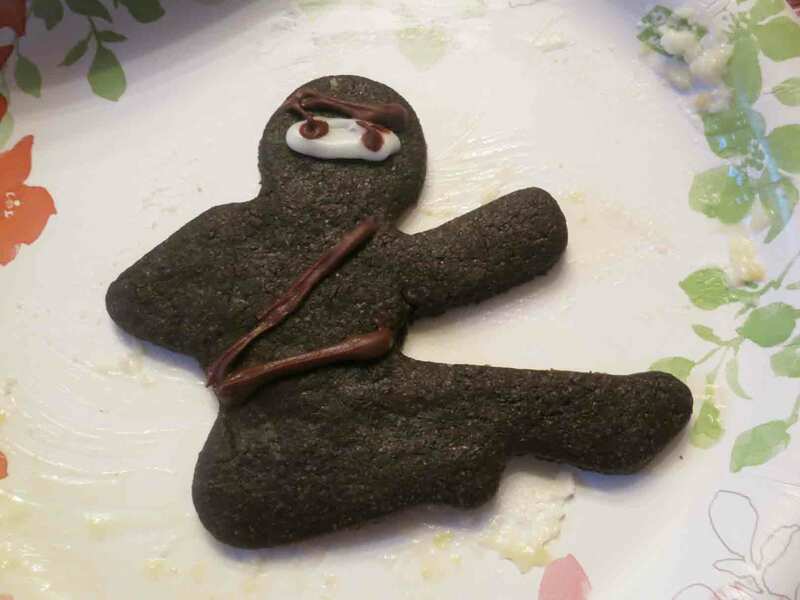 In keeping with the ninja theme (it was a really cute baby shower), I finally broke out my ninjabread men cookie cutters and made ninja cookies. After the mini animal donuts I wasn’t exactly in the mood to make more icing, much less multiple colors of icing in small batches, so I decided to make these more traditional in color (black) and use my extra-dark cocoa to make chocolate cutout cookies. This way I only had to use a little melted white chocolate for the faces, and I could decorate the rest with melted dark chocolate. This is my go-to recipe for chocolate cutout cookies. 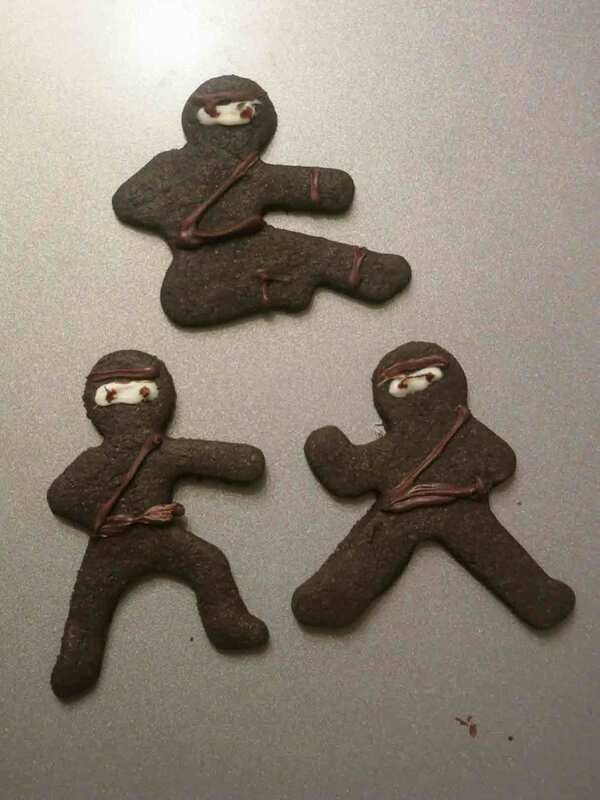 They don’t really spread at all during baking, so they’re ideal for detailed cookie cutters. Skipping the chilling of the unrolled dough makes the process go faster (soft dough rolls out more easily anyway), and freezing the cut cookies helps them keep their shape in the oven. Plus, they’re delicious– buttery, with good chocolate flavor and a hint of salt. 2. Beat butter and sugar together until smooth (doesn’t need to be light and fluffy). 3. Add eggs and vanilla and beat again until smooth. 4. In a separate bowl, combine dry ingredients. Add to butter/egg mixture and stir on low speed until fully combined into a soft dough. 5. Roll out dough 1/4″ thick on floured board and cut as desired. Place on parchment- or foil-lined baking sheet and put in the freezer for 5 minutes to firm up. 6. Bake approximately 10 minutes, rotating pans halfway through. Let cool on sheets for 5-10 minutes, then remove to rack to cool completely. To decorate, I put a handful of white chocolate chips into a plastic squeeze bottle and microwaved them in 30-second increments until softened. I squeezed horizontal line segments onto the faces to represent eyes above a face mask, then melted some dark chocolate chips in another squeeze bottle to add eyes. I used the rest of the dark chocolate to pipe some belts and other details, though they turned out kind of messy– melted chocolate never flows down prettily unless you get the temperature (and probably the temper) just right, which I never seem to manage. In any case, the cookies turned out adorable and delicious– a win all around!